Yesterday Elis and I visited Lemsford Springs nature reserve, which is run by the Herts and Middx Trust for Nature Conservation. This site is a small area which was farmed for water cress in the past and is now managed for wildlife. We went there as we had heard that a Jack Snipe had been seen there the previous day. The morning dawned bright and sunny and we were very hopeful of seeing this bird as it was also very cold a frosty but, even with warden Barry Trevis who accompanied us to the hides helping us, try as we might we could not find the Jack Snipe. We did think at one time that we had found another bird, white-over-white However we discovered that this combination didn't exist and was merely a trick played on us unwittingly by W-O-G who stood with his leg submerged up to and including the green ring thus obscuring it, the reflection of the white ring made it look like there were two one above the other. All the Green Sandpipers hold a feeding territory in the cress beds, with very clear boundaries. W-O-R entered that of W-O-G which then spent a good while chasing the intruder around, resulting in a certain amount of fisticuffs. eventually W-O-G made a lunge for W-O-R..
and again, They upset the local Common Snipe population with their shenanigans. The three Common Snipe also present in the cress beds, tried to go about their business ignoring the hullabaloo that was carrying on around them, but whenever the sandpipers got too close for comfort the snipe would strike an aggressive pose making themselves as big as possible, like the bird in the picture above. They would fan their tails and twist them through 90° and at the same time either raise their wings as this one has, or spread them, dropping the nearest wing and raising the furthest from the sandpipers as the bird in the photo below shows. The last reaction we witnessed was when they to dropped their breast into the water, raising their tail high and fanning the it and contorting it to face the warring sandpipers. and sometimes all three together. Elis caught one of the snipe raising its wings, not sure why it did this, the sandpipers had gone quiet and were a long way away by this time. Barry took us for a walk around the reserve and the great Jack Snipe hunt was on. We were joined by a young volunteer by the name of Drew who helped us look. Together they showed us various places where Jack Snipe had been seen in the past and we saw a further two Green Sandpipers making our total to five in all. We also saw many Green Sandpiper pellets. They eat a huge number of shrimps during a day and the indigestible carapaces are ejected in the form of a pellet. Green Sandpiper pellet made up of the undigestible remains of fresh water shrimp. Finally we left the reserve after thanking our host and his assistant for their time and kindness, Barry and Drew went to count herons in another part of the county while Elis and I, at their suggestion, headed for Tewinbury Farm reserve, in search of our elusive Jack Snipe. Upon entering the hide at Tewinbury we found another young lad from St. Albans there and he said that the Jack Snipe that Drew had seen the day before, had just stepped out of sight, typical. But, as I settled down for a long wait, I spotted the bird more or less where it had last been seen and it stayed on view for a considerable time. At one stage it was possible to see both Common and Jack Snipe at the same time making for a useful comparison but you had to look hard to find them. Jack (foreground) and Common Snipe. We were able to watch the Jack Snipe for some time until it eventually bobbed its way out of sight. Once it had disappeared we left very happy with our morning's birding. Driving back home through Herts, Bucks and then Northants we noticed a large number of mobile lapwings. Several flocks were seen on various fields and others in flight. Our assumption is that these are part of an influx from Europe, birds escaping the freezing conditions there. 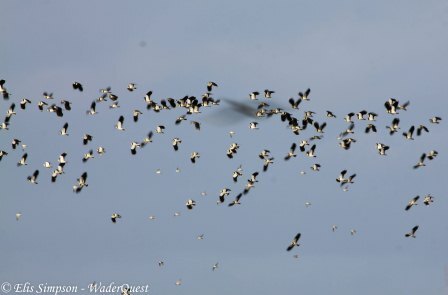 Lapwing flock taken at Slimbridge earlier in the year.